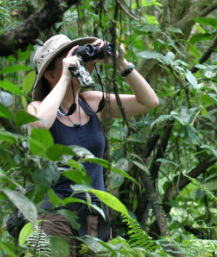 I am a biological anthropologist with research interests in evolutionary anthropology, primate behavioral ecology, and tropical forest ecology. My research has focused on ontogenetic effects on posture, locomotion, prehensile-tail use, and the behavioral, arboreal, and resource-based contexts of these patterns in wild mantled howling monkeys (Alouatta palliata) and white-faced capuchins (Cebus capucinus) inhabiting tropical forests in Costa Rica and Nicaragua. I teach in the Anthropology Department at Santa Clara University in Santa Clara, California.